Fall approaches, and with it comes the Meadow Saffron flowers. The first thing you notice about the flowers, is that they exist long enough to be seen. 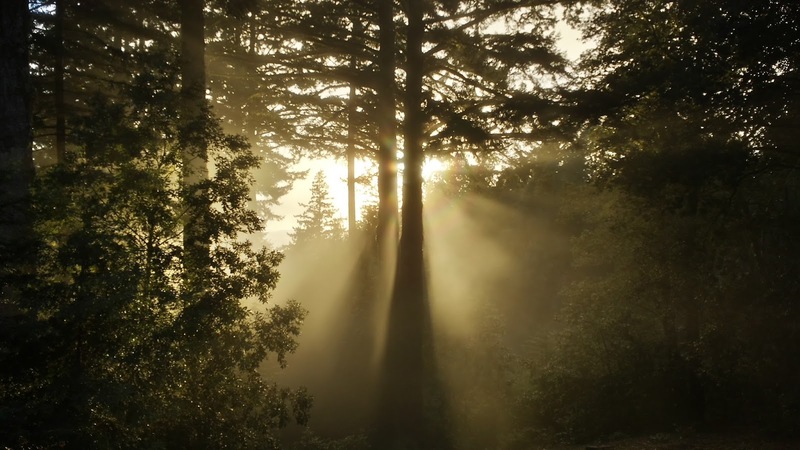 That may sound odd, but we live in a wilderness of sorts, the northern Santa Cruz Mountains. Long ago I came to understand that despite my urges towards farming, all my efforts ammounted to was feeding the wildlife. 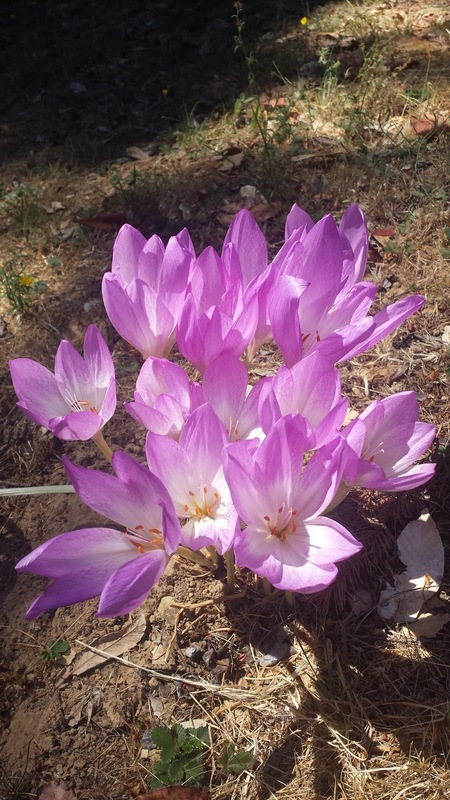 Then the Colchicum autumnale flowered. And, the flowers stayed. The reason is simple: these plants are full of a deadly alkaloid, Colchicine. Colchicine is an amazing alkaloid, in that it has a very specific mode of action: it prevents chromosome pairs from separating during mitotic cell division. 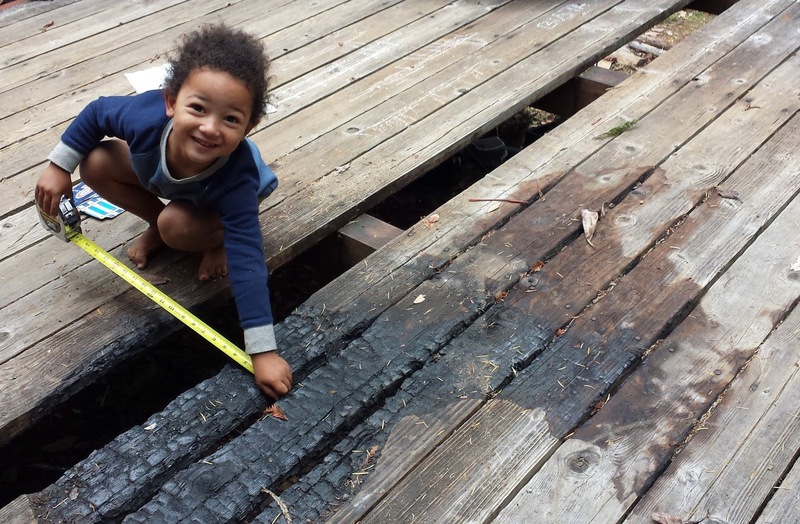 It sounds odd, but this mode of action has proven invaluable to genetics. Before sequencing, people looked at and counted chromosomes as a way to study organisms. Karyotyping is dependant on Colchicine. This is the plant that is the source of Colchicine. These are our own selections - we crossed an atypical white-flowered Brunsvigia littoralis with a deep red Amaryllis belladonna, and of the hundred or so seedlings that resulted over three years, six have pristine white flowers or at most yellow highlights. It has taken a decade to find this out - the last seeds in this cross were planted in Fall of 2004. If this seems a long time, at least they flowered faster than the Brunsvigia parent (which took 28 years from seed). 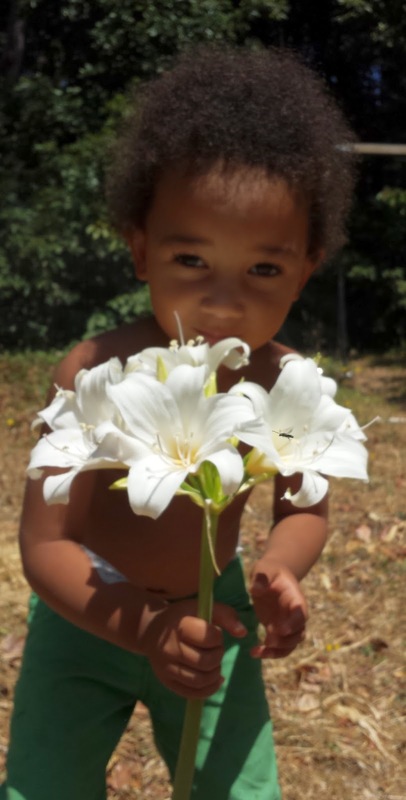 Our young helper enjoys the fragrance and especially the picking of the flowers (with occasional bouts of dubiously-advised swordplay and derring-do, flowers abused such never make it out of the yard....). Some of them do leave the yard, those are available only at one florist, in Half Moon Bay, California: Alena Jean carries our flowers when in season. Madrone Bark Tea - Warm Tea for Foggy Mornings! In high season now, the bark actually began to fall in August and will run into October! This bark makes my favorite tea made from local trees, and my favorite year-round locally foraged tea. 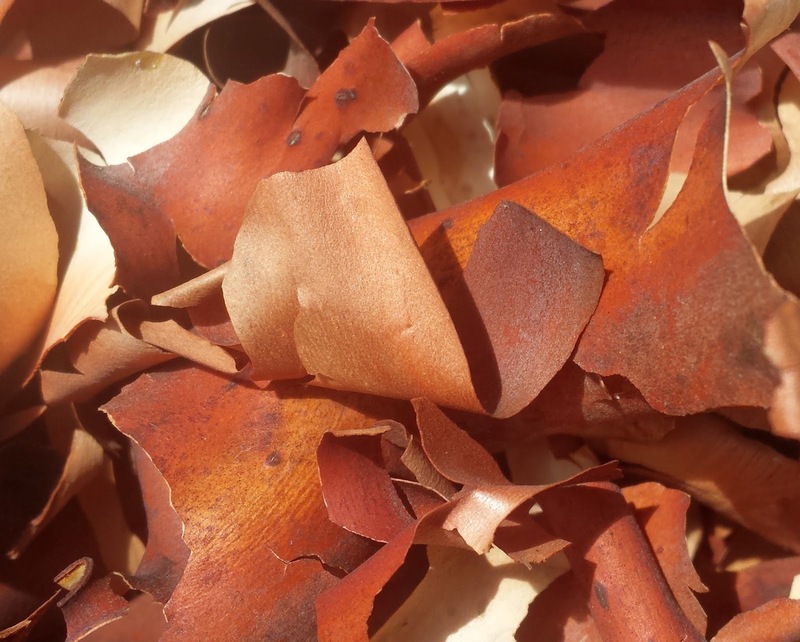 Most trees have bark that come off in granules or big chunks, but the bark of the Pacific Madrone (Arbutus menziesii) curls and peels in thin layers, falling to the ground when the mornings are foggy and the afternoons are sunny in the late summer and early fall. 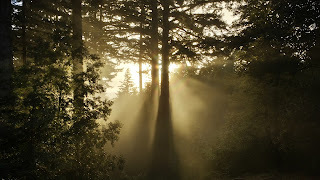 Just clear an area under a Madrone tree on a foggy morning, and then pick up bark curls in the late afternoon when the air is warm and dry. The barks curls and uncurls as the humidity changes, often fast enough that it can be watched dancing in realtime. To make tea, I crush a handful of bark curls into a cup (or grind them), add boiling water, and let steep for 5 minutes, then decant or filter off the bark. This makes a lovely tea with very little bitterness or astringency and a mild flavor vaguely in the range of Raspberry Leaf or Cranberry - you will have to taste it yourself to form a proper opinion. Sweetening the tea a bit strengthens the flavor. Stronger tea can be made by boiling the bark - the flavor gets stronger, but does not seem to change other than that. Some important notes: (1) there are many species of Madrone, some common in landscaping. I recommend being very careful to identify the tree that you are getting bark from, and be certain it is Arbutus menziesii. 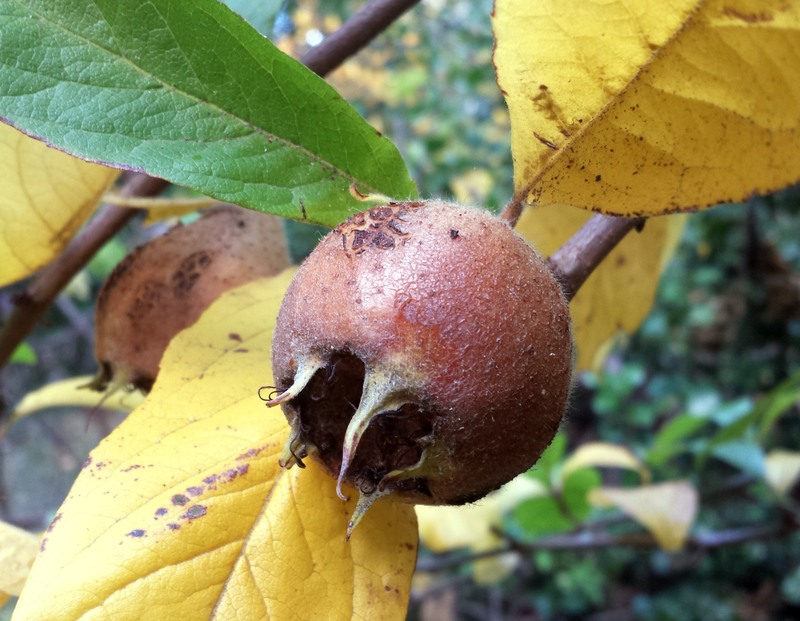 While other Arbutus may make tea, I've not tried it - and getting the tree identification wrong could lead to serious problems. (2) Pick bark from trees away from roadsides and landscaping - often these are sprayed for bugs or by who-knows-what. We maintain a few acres of wild trees for this among other purposes. If you need help identifying a tree, contact us and we can attempt to assist, or contact your local agricultural extension office. Enjoy! Picture a tall, cylindrical mushroom - with a great flavor that matches well with eggs and salsa. It is the tasty Coprinus comatus, or Shaggy Mane.Yum! These showed up at the edge of our apple orchard just from the "rain" that our fir trees made from the recent fog (we live in a seasonal cloud forest). This has another name - the Inky Cap. Why would it be called that? 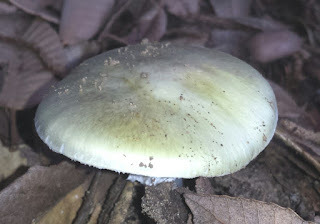 Well, if you let it stay out in the wilds just a little longer, you are left with white stems only - the cap of the mushroom dissolves into a black liquid that makes a good ink. The mushroom ink was once mixed with more common inks to validate official documents - the spores could easily be spotted with a microscope, and would provide evidence the document was real. This mushroom is even part of the Declaration of Independence - even though there were 56 cosigners (document authentication not an issue), the ink still contained Inky Cap ink so King George III would take the document perhaps just a little more seriously... You can read about it here. This makes it the only mushroom making an appearance in Hamilton (had to include a cultural relevance note!). Sometimes our world is stranger and more wonderful than I've found in even fiction - for example, look at Hemitomes congestum. 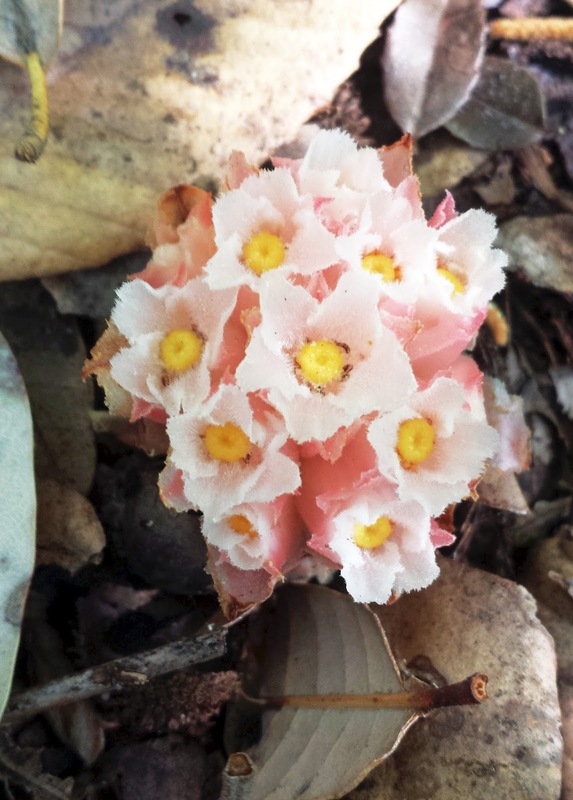 These plants are flowering now in our yard, near the southern limit of the range of this species. That's good, because they are lovely, and because it is the only part of the plant that ever comes above ground. They don't need more of themselves exposed to the vagaries of above-ground life, as they have no chlorophyll and, unlike the vast majority of plants, do no photosynthesis at all. With most parasitic plants (think Mistletoe or the Paintbrushes), the parasitic plant connects directly to some other, green, host plant - they tap the vascular system by imitating a branch or a root, as far as the host is concerned. That is not how this plant works. The roots of Hemitomes are corraloid - a very strange looking affair sort of looking like a woody upside-down cauliflower. It doesn't touch or connect directly to any other plant. Instead, it pretends to be a mushroom. 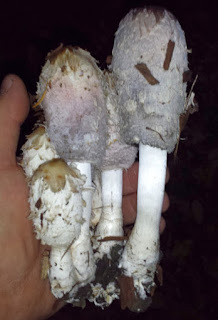 It does this very well, convincing the underground mycelium (the underground and largest part of the mushroom organism) of the mushroom to give it water, nutrients, and sugars just as if it were a growing mycelium or fruiting mushroom. It is backwards - most times fungi contrive to get nutrients from the roots of plants, but in this case (and a very few others) something went weird, and the flow turned around. The mushrooms these plants depend on are generally pilfering nutrients from plants in the forest by connecting to their roots. This is generally called mycorrhizal symbiosis, where the fungus essentially barters simple nutrients to the plant root in exchange for lipids and sugars to feed the mushroom. In many cases, this sort of life strategy is a powerful win-win, with the plants getting minerals from a larger area than their roots can cover, and the fungi getting a stable source of food. Some of the best of the edible mushrooms live this sort of life, including the Chanterelle and the Boletes (Porcini, Butter Boletes, etc...). Few plants have figured out the trick, though. Two others in our area will be flowering soon, and I'll say something about them later. They are wild Orchids, no less! Dichelostemma ida-maia, the Firecracker Flower, are bulbs native to Northern California. If you are lucky, you might encounter them in flower this month along mountain roads. These we grew from seeds, and it has been a ten year wait to see them flower (we had a problem with rodents deciding the bulbs were very tasty, which has proven to be a harder problem to solve than we expected - planting them inside wire mesh spheres has helped). They have been worth the wait! This is the last species of Dichelostemma to flower for us this season (it starts with D. capitata in February). They are a lovely way to wrap up Spring. You can find these online as full-grown bulbs for sale, if you want them without the wait. Sweet cherries abound this time of year - then there are the Sour Cherries, which can be deucedly difficult to locate for fresh eating, but which most people have encountered in pies or as Maraschino Cherries. The best of the Sour Cherries also make, while a bit tart, wonderful fresh eating cherries, with the advantage of pits so small that I do not worry about our toddler choking on one. In my opinion, the best of these is a relatively new variety called Northstar. It is the first widely released new sour cherry variety in over a century (Montmorency and Morello are more common, and they are about the only other varieties that can be easily found). Further, these can be had grafted to very dwarfing roots, so that the bearing tree is barely taller than my toddler and easily picked by him. Last year, he ate them all. 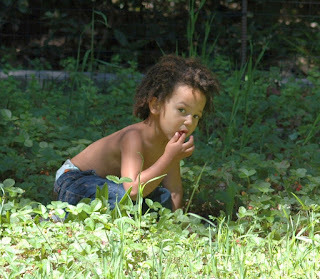 This year, he has been watching it and carefully inspecting the green fruits for any blush of developing color. 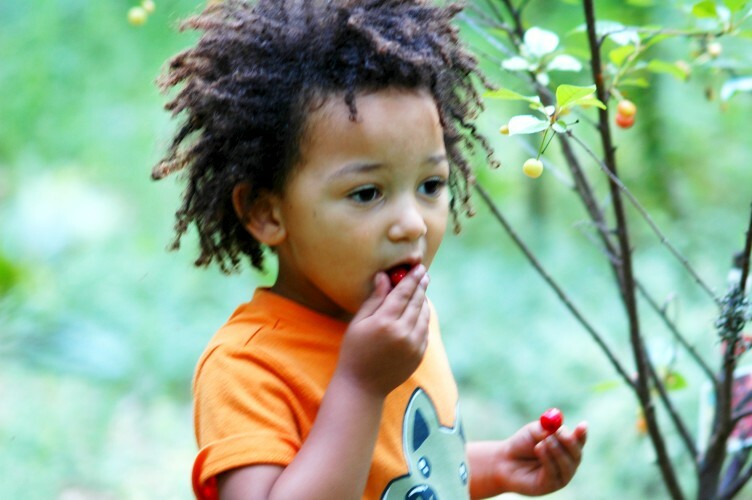 Today, the first cherries were ripe (or close enough for me to allow him to pick them...), and we had a minor picking party at the tree. Only two cherries made it to the house for mother and sister to try. Who knew California had a wealth of native tulips? The Mariposa Lilies and their kin are right now flowering across the state, ranging across the spectrum in colors and sizes and shapes. Please leave them alone when you find them - they can always use our respect for their simple existence in the wilds that remain. 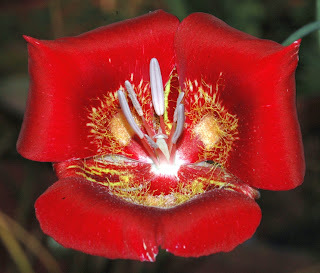 This is one of my favorites, from the Tehachapi Mountains of Southern California: Calochortus venustus, the red form. This species ranges from white through yellow, pink, red, and even some intense purple flowered forms, but this is the one I first met and still find the loveliest of a wonderfully diverse species. They can be grown from seeds with patience and care (our seeds are here, with more species being added as we harvest the seeds over the next two months). These grow to flowering in between three and five years, and are well worth the wait. These are a festive marker of Summer being nearly here when they bloom, as many plants have all ready dried up for the season in the heat of late Spring. 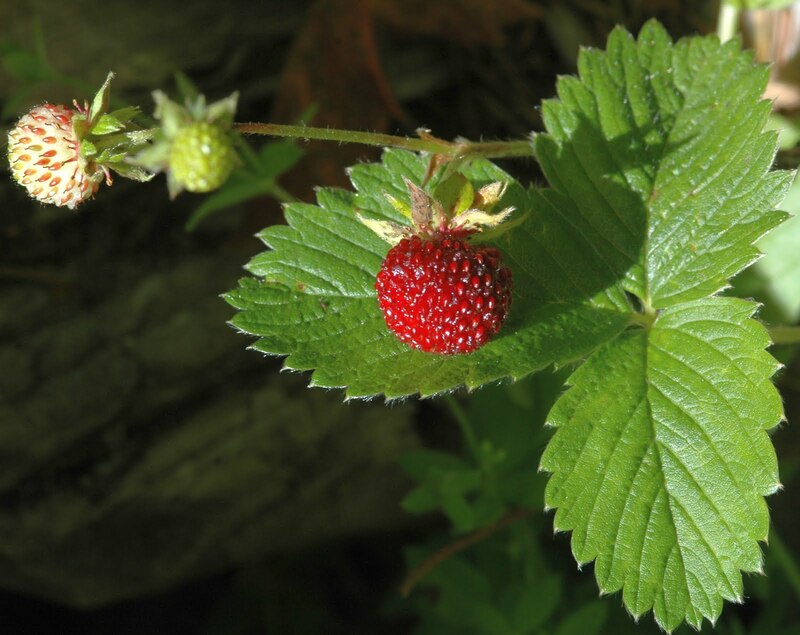 This is one of the California native species; ours are actually the same species that in Europe is called an "Alpine Strawberry", Fragaia vesca. (You can get the seeds from our Amazon store if you have to have them yourself...). When ripe and at their best, they are very dark red and intensely flavorful. Sort of like having taken a large commercial strawberry and having extracted all the flavor, and then packing it into a very small berry. This is a part of Spring I always look forward to, and now is the time to find these! My son ran to me this morning exclaiming "Daddy, daddy, there's a birthday moth on the deck!". 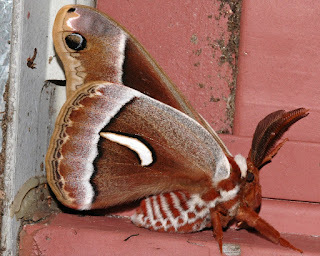 Almost every year, the Ceanothus Silk Moth (Hyalophora euryalus) makes an appearance on our front deck around the Vernal Equinox. The day our son was born, three showed up - when I explained this to him this year, he started calling them "Birthday Moths", which seems to have now stuck in our home. Most years, we get one or two, over a week or so. This year has been a bit of an odd duck - we've had almost a dozen, with moths showing up on the porch in February, April, and May - with the latest showing up yesterday (May 17th), by far the latest in the season we've seen them at our home. These are enormous moths, larger than the Monarch butterfly, one of the largest Lepidopterans of California, if not the largest. They are harmless, with enormous caterpillars that eat several native plants, including the native Ceanothus species. They have become quite rare in many areas where they were once common, but do not appear to be in serious trouble as a species. We went several years without seeing any, so when they began showing up again we were delighted. For scale, this moth is about four and a half inches face to rear of wings, with about a six inch span when open.